Colder air is charging in overnight. With a very turbulent atmosphere, we've seen brief downpours, hail, and even snow. Colder air funneling in may create a few slick spots in Greater Worcester, otherwise gusty winds should dry out the roads before we fall below freezing. Tomorrow is a colder day, but seasonably so. Sun will blend with clouds and the winds will back off a bit. Our focus then turns to a storm spinning in the Deep South and its track off the coast of New England on Friday. She's close enough to get our attention, but not enough to get us worked up for a big storm. We'll certainly be cold enough that there's no rain vs. snow issue - even on Cape Cod there's a possibility of accumulating snow. 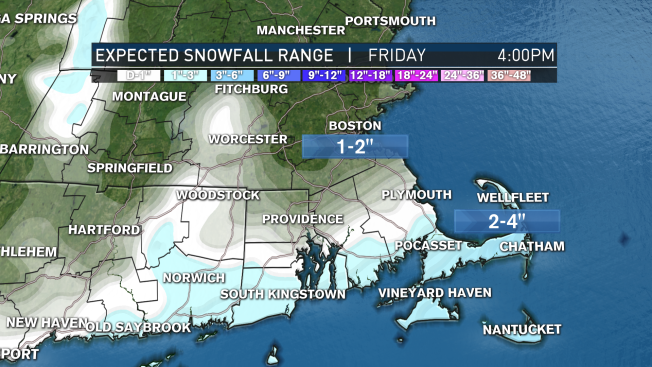 Timeline brings the flakes up to New England early Friday morning, with a quick exit by early to mid afternoon. Next up is a larger, stronger storm on Saturday night. However, this one is just a little too far out of reach to cause much concern. I'm seeing some Cape snow showers, but nothing more. It WILL draw down some colder air from Quebec, so prepare to shudder by Monday morning as we fall into the single digits.